At Medelita we have taken the necessary steps to ensure that your online purchase is safe and secure, using Verisign information security services. Every time you send us your credit card number and your billing and shipping information, we use Verisign technology to prevent that information from being intercepted. There may be occasional, accidental errors found on our website. We reserve the right to make corrections in the event of a misprint or change. We accept Visa, Master Card, and American Express for all types of orders (internet, phone, and fax). If you reside in California or Texas and are not a reseller or tax free governmental agency, we are required to add applicable sales tax. If you are interested in purchasing Medelita lab coats or scrubs in large quantities or are in need of a special RFQ, we will be more than happy to provide you with a customized price quote. Please fill out the group order sheet here. You will be promptly informed by email of delivery dates for garments that are back-ordered. Other items in your order, if available, will be shipped immediately. There is no additional shipping charge for backordered items. We apologize for any inconvenience if your selected items are not currently available. Have a question about our scrubs or lab coats? Not sure about sizing? You can contact Medelita by calling our customer service line (877) 987-7979 or emailing contact.us@medelita.com. All emails are received and/or replied to by a licensed healthcare professional and/or highly trained customer service representative, who understand the intricacies of medical apparel. Customized upscale gift invitations can easily be arranged. This is an ideal way to offer your staff and/or customers a unique, customized gift, without having to worry about sizing or color selection. Please send an email to contact.us@medelita.com. If for any reason you are not happy with a non-embroidered item, please return it within 180 days of your original order date for a refund. We will credit your original payment method, excluding original shipping & handling costs, once we are in receipt of your return items. If we made an error on your order or there is a sewing problem or quality issue, please call us at 877.987.7979. Please allow 3-5 business days after your order is received in our warehouse for your return to be processed. We're happy to send you a prepaid UPS mailing label for your return, if you contact us within 30 days of the original order date and you reside in the contiguous 48 U.S. states (excluding Alaska, Hawaii, and Puerto Rico). We politely ask that in order to receive a prepaid mailing label, that you first send us an email at contact.us@medelita.com explaining the reason for your return. Please include your order number, full name, and preferred contact information – phone or email. We proudly stand behind the quality of our product at Medelita. We will warranty all non-clearance items from any manufacturer flaws, defects or failures for 12 months after the date the garment was originally shipped from our warehouse. We reserve the right to refuse warranty on any item that appears to be damaged by misuse, modification or repair. We truly want you to obtain the right size and fit. It's a fundamental value of our company – true fit and comfort for all medical professionals. So if you ordered a non-embroidered item and would like to try a different size or style, just send us an email (within 30 days of your original order date) at contact.us@medelita.com. If you reside in the contiguous 48 states, we'll be more than happy to email you a UPS return label for your exchange (free of charge, within 30 days of the order date) if you simply tell us the reason(s) for your exchange. Be detailed or be brief – it's up to you. Once you receive the UPS.com email, please print the label and affix to the box or bag and drop off at your local UPS Store or drop box location. In summary, if you're a continental US resident (this excludes Alaska, Hawaii, and Puerto Rico) and have decided to exchange an item, you will only pay the original shipping and handling charges. We'll pay for your exchange items to come back to us (via UPS) if you contact us within 30 days of your order date, and we'll pick up the cost to send out the new items. Not a problem. We reserve the right to refuse a return if it has clearly been worn, laundered, or excessively soiled. Do you provide a return label for multiple exchanges? We are happy to provide one complimentary return label per order. If this is your second return within the same order, you will need to provide the means to send the garment(s) back for the second exchange. We consider Medelita customers to be colleagues. For that reason, we guarantee all products that we make. Period. We are the only medical apparel company with third party performance fabric certification from DuPont® and drirelease® with FreshGuard®. If any of our products don’t meet your expectations, send them back within one year from the date your order was received - for repair or replacement. Damage due to normal wear and tear will be repaired at a reasonable charge. We reserve the right to exclude items from the Professional Courtesy Guarantee™ that have not been maintained per our care instructions (including the use of chlorine bleach on any product), or items that have been altered or abused. If you have questions about care of your garments we are happy to help provide in-depth recommendations. Please note: Medelita Clearance items and Certified Seconds are EXCLUDED from all Professional Courtesy Guarantee™ policies, including all exchanges and/or returns listed below. All sales on Clearance items and Certified Seconds are final. Some coupon codes, including free shipping coupon codes, do not apply to clearance items, certified seconds and/or items on sale. We cannot accept returns on embroidered items. If you are unsure about sizing or style preference, we suggest that you place your first order without embroidery. All sales of "Clearance" items are final and may be eligible for exchange, however we cannot issue refunds on these items. All original tags must still be attached. Garments are to be returned in excellent condition - without stains, makeup, or soiling of any kind - just as you would want to receive your order. Medelita uniforms are worn in hygienic environments, and thus must be presented to our customers with 100% cleanliness. By law, all garments returned must be clean; please wash all soiled garments prior to returning for repair or any reason. MEDELITA does not accept under any circumstances returns or exchanges that are soiled, worn, or anything that is not in new quality condition. We reserve the right to refuse a return if it has clearly been worn, laundered, or excessively soiled. Please place the garments inside the original garment bags. Medelita offers free exchanges and returns when a customer notifies us within 30 days of the order date. A UPS return label can be retrieved in your account detail page. We also ask that you please fill out and include the accompanying form to make sure your request is processed correctly and promptly. We are always happy to email a UPS return label when notified by email or phone if you wish to contact us directly. Returns and exchanges between 30 and 180 days from the date of purchase require the customer to pay for return shipping. We do not accept returns or exchanges after 180 days from the original order date. Original shipping and handling charges are not refundable. We're happy to provide personalized attention to each order - individual or group. Email us at contact.us@medelita.com. I'm trying to get a return label but it is not working. What should I do? If you placed your order without embroidery and the order processed before 2pm PST, the order will ship that same business day. If your order has embroidery, the ship date is up to 5 business days after the date of your order. UPS delivery times for free ground service is 2-7 business days depending on the distance from the Southern California warehouse. The approximate date of your deliver is shown on the bottom of your emailed invoice. Tracking numbers are emailed via UPS once the order has shipped. Do you offer group ordering packages? Yes! We welcome the opportunity to outfit your office and/or department, and are committed to making group ordering an easy, streamlined process. Please complete our group orders form by clicking here and a Medelita representative will help you with questions about group pricing, custom logo embroidery, name & title embroidery, and sizing. Can I order a trial size? Do I have to pay up-front to try on at home? Yes, trying on different sizes is easy using the Home Try-On Program with Free Shipping And Returns. You do have to pay up-front. In order to provide you with plenty of time to return or exchange without having to worry about paying for shipping either way (within 30 days), we treat these as normal orders to expedite the process. Why are your lab coats expensive? Years of research and development have been applied to making the best fabric and fit in the industry. We are personally involved in every step of the process, from the fabric thread we use down to which buttons are used for each specific coat. Attention to detail is monumental for us, which is why we design coats specifically to meet the needs of the individual who will be using the product. Our lab coats have moisture wicking and fluid resistant certified bacteriostatic fabric technology, are environmentally friendly and extremely easy to care for. Hydrophobic technology is built into the coat allowing fluids to bead up and roll off with ease. Ground in and oil based stains release easily from the fabric with laundering. On the inside, we added bacteriostatic hydrophilic technology to neutralize bacteria and to wick moisture away from the wearer. Since so much goes into creating the best lab coats in the industry, it becomes difficult to provide these features while charging the same price as other lab coats available to you. We firmly believe it is worth it. We provide a beautiful bright white coat infused with the latest technology with a one year professional warranty should anything happen to it. We are dedicated to making sure you receive the product you deserve as a hard working professional and the assurance that should you have any questions or concerns, we are only a phone call or email away and will do everything we can to make sure you are satisfied. We also offer complimentary shipping and returns and are happy to accept back exchanges and returns. If you would like more information about our lab coats, it may be found here. If you have any further questions about our lab coats please email your question to contact.us@medelita.com and a representative will get right back to you. How many days do I have to exchange garments or return for a refund? You are able to send the products back with complimentary shipping if you reside in the contiguous US and your order was purchased within the last 30 days. We will accept returns/exchanges for the first 180 days of your purchase. We will accept the return/exchange as long as the products are not embroidered, altered, and have no evidence of being worn, soiled, or washed. Does Medelita Manufacture in the USA? We initially made both lab coats and scrubs in the U.S., starting in 2008. It was our goal to support U.S. manufacturing long-term. However, as we grew in experience we realized that the U.S. apparel market specializes in knit wear (mainly t-shirts) that can be mass produced at low cost and profitable for those manufacturers. Medelita garments are all made from technical woven fabrics and require difficult sewing techniques and machinery, and surprisingly our costs kept going up as our volume increased. We worked for years to source a new U.S manufacturer that could sew technical wovens at a fair price. There came a time in our company history that we had to decide to either go out of business or move our manufacturing overseas. It took a year to convince our founder that this was the best decision in order to maintain our most important goal of providing the highest quality, professional, performance garments to clinicians. We very much hope that the state and government make changes to support manufacturing for small businesses in a way that would allow for profitability. So although we do not manufacture our garments currently in the U.S., we are proud to hire 26 full-time employees and to provide benefits to those extremely dedicated people in Laguna Hills, CA. How can I order outside of the U.S? Medelita is pleased to offer direct shipping to many of our customers outside of the United States. For all international destinations, complete details are provided on our International Guide Page. Will an iPad only fit in the outer pockets? The interior pocket on our lab coats is not big enough to fit a standard sized iPad, as the inside pockets need to be smaller than the outside pocket so the stitching does not show to the front. The front interior pockets are large enough for most smart phones, and the inside pockets are quite large in general. But only the lower front pockets are big enough to accommodate an iPad or iPad2. An iPad mini will fit in both the outside pockets and the interior pocket. Do you have colored physician coats? Unfortunately we do not have physician coats in other the colors. The only color we have at this time is white. Can I order two different styles to try on vs. sizes of the same style? Is there a difference in sizing between the Laennec and H.W. Cushing? If the Laennec size 36 fits you loosely then yes, you will wear the same size in the H.W. Cushing. Overall the H.W. Cushing is narrower than Laennec in the shoulders and torso, yet comfortable, ergonomic and functional. Both the H.W. Cushing and E. Wilson are slim fit styles v. the classic-fit style of the Laennec. However, if the size 36 Laennec fits loosely only in the torso (not the shoulders) and you have especially broad shoulders, you may need to try on the size 38 Cushing. How long and tailored are the E. Wilson and H. W. Cushing white lab coats? 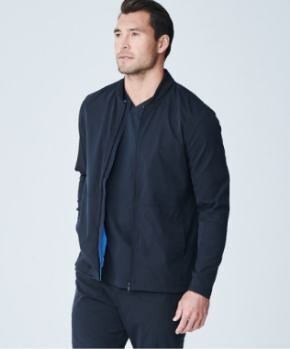 The E. Wilson is an American slim fit lab coat. The E. Wilson is more tailored than the Laennec but less than the H. W Cushing and Bernard. It is going to be our longest lab coat as well. The length at size 36 is 37.25 inches. The length at size 46 is 39.5 inches. This lab coat is recommended for taller individuals or individuals that like long lab coats. The E. Wilson runs true to size in US sizing. The H.W Cushing is a European slim fit lab coat. It will be more tailored than the Laennec and E. Wilson but less tailored than our true European blazer, the Bernard. The H. W Cushing is two inches shorter than the E. Wilson. The length at size 36 is 35.25 inches. The length at size 46 is 37.75 inches. The lab coat is recommended for shorter individuals or individuals that like shorter lab coats. The H. W. Cushing runs true to size in US sizing. Do you carry plus sizes in lab coats? Are your lab coats wrinkle-free? They are not wrinkle free, which would require a very high polyester content. 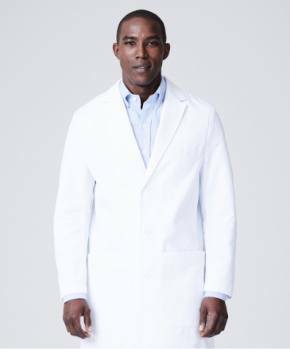 Our natural fiber cotton lab coats are wrinkle resistant, thanks to a patented finishing process that we use. The clearest analogy that we can give, is if you prefer to iron your khakis or your jeans, then you likely will want to press your Medelita lab coat. Others who don’t necessarily want a pristine, crisp finish, are fine with pulling their lab coat out of the dryer early in the dryer cycle, then hanging to dry, with great results. How thick is the lab coat fabric? We’ve spent five years developing a custom lab coat fabric of the perfect weight. 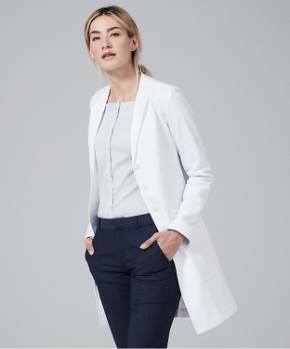 And perfect lab coat fabric is a tall order – worn inside, over professional clothing or scrubs, in extremely varying climates (both indoors and out). The key was choosing a high-performance, grade A cotton fabric and then selecting all custom features for weight, drape, weave, and functionality. As a result of our dedication to these critical decisions, our fabric is light weight, breathes well, is soft, and more comfortable to wear than any other lab coat you’ve previously owned. Do you have tall scrub pants for men? We do not offer specifically tall/short sizes for men. Our fit model is 6'0.5" and the top/pants fit him well. Here are the inseam measurements for the scrub pants. 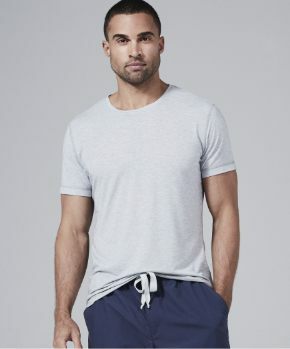 Men's inseam for Modern fit are as follows: Small: 31" Medium-Double XL: 32" Men's inseam for Element are as follows: Small- Double XL: 32.5" We encourage individuals that reside in the contiguous US to try them on with our try at home policy. Do you carry maternity scrubs? Can I customize the scrubs? Our scrubs are made in bulk, so custom options are not available at this time for individual or small group orders. We are able to accommodate large group orders for custom colors or features over 800 sets. How thick is the scrub fabric? Will it breathe in hot weather or warmer settings? The weight of our scrub fabric is what you've always been accustomed to – but ours has a softer feel and a less pajama-like drape. The result is that Medelita scrubs look very much like traditional scrubs, but with a visible upgrade to quality and color saturation. Our scrubs are certified Drirelease® with FreshGuard® so they wick moisture away from your body, dry extremely fast, and don't allow odors to trap in the fabric. They are ideally suited to hotter weather or warmer settings, because of their patented moisture wicking/cooling technology. This feature lasts the lifetime of the garment, is environmentally friendly, and is an inherent property of the yarn itself (will not wash out). The only thing that blocks this special technology is fabric softener – please avoid it when laundering our scrubs. Do these scrubs fit true to size? The Modern Fit scrubs are mean't to be roomier and do fit true to US sizing. The Element collection is meant to be more fitted and fit true to US sizing. If you are between sizes commonly, order two sizes (without embroidery) and see which one is most comfortable for you. We offer complimentary shipping over $100 and complimentary returns & exchanges within the contiguous US. Will the scrub fabric soften up over time? While the scrub fabric starts off exceptionally soft from the moment your new order arrives, the scrubs will continue to get softer with each wash. They should not wrinkle. Perhaps if you left them in the washer after a fast spin cycle and forgot about them for a week – they might. But placing them in the dryer and removing them promptly should leave them wrinkle free. Do you offer petite/tall sizing for women's scrubs? Unfortunately we do not at this point in time. Our scrub pants are longer to accommodate a wider range of individuals. The pants may be hemmed or let out 1". Here are the lengths for the scrub pants. 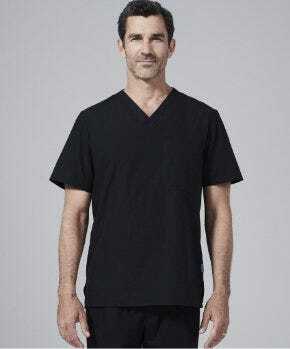 Modern Fit inseam XS: 29" Small: 30" Medium-XL: 31" Element inseam: XS-XXL: 32" We do encourage all individuals that reside in the contiguous US to try out scrubs at home with complimentary shipping on orders over $100 and complimentary returns & exchanges. At Medelita we offer UPS Ground, UPS Next Day Air and UPS 2nd Day Air delivery to P.O. and F.P.O Boxes. A small handling fee includes the cost of preparing your shipment, selecting, and packaging the products you've purchased. Original shipping and handling charges are not refundable. Usual delivery time for UPS Ground is 2-7 working days, depending on your distance from our Southern California warehouse. Please allow add an additional 3-5 days for any orders containing products that are sold in the Medelita Marketplace and/or are not made by Medelita. For international orders, please allow 3-5 business days for Worldwide Expedited Service to most locations. International rates and shipping charges will apply. You may/may not receive a separate duty charge/bill directly from customs (separate from Medelita), depending on the importing policies of your country. Medelita is not responsible for any applicable duties or import custom fees. Click here to calculate international shipping rates to your country. Our website accepts orders 24 hours per day, 7 days per week. We process orders during our hours of operation Monday – Friday, 8 am – 4:30 pm, excluding holidays. Orders placed before 2PM PST will be processed the same working day. Orders placed after 2PM PST, or on a weekend, will be processed the next business day. Can you ship to an FPO Address? Unfortunately UPS does not deliver to FPO addresses. However, we will still honor our standard UPS ground shipping prices and promotions (i.e. flat rate shipping and free shipping over $100) if you require an FPO address as your shipping address. Simply choose “Ground” as your shipping option on your order and we’ll make sure we get it to you. When I choose Next/2nd Day Air for my embroidered order, when can I expect to receive it? While UPS Next Day Air and UPS 2 Day Air does expedite the actual delivery time in transit of your order, it does not expedite the embroidery timeline. Embroidered garments take up to 5-7 business days prior to shipping, depending on time of year, medical conference attendance, and group order volume. If you need to expedite an order with embroidery and cannot wait the typical 10 business days, please contact our office to request a "Rush Service." There are additional fees associated with rush service and our Customer Experience Team will be able to assist you. Orders placed on Medelita.com with a subtotal of $100 or greater will be eligible for free shipping within the United States. Shipping discount does not apply to past purchases, UPS 2nd Day Air, UPS Next Day Air, or to any shipping destinations outside the United States. Shipping discount is automatic at checkout, and no code is required. Shipping discount is valid for group orders and or bulk purchase orders. How does the try on at home program work? You place an order for your preferred style with the sizes that you'd like to try on. Keep the garment that works best for you and send us back what you don't want using our prepaid shipping label. Please note that trial orders must be placed without embroidery. You can find more information on the Home Try-On Program with Free Shipping And Returns. To ensure consistent quality in our finished products we maintain an extremely sanitary environment in our embroidery studio. Unfortunately due to these concerns we simply cannot add embroidery to used, worn, washed, or soiled garments. We advise that you consult your local tailor for alternative options. What if I order 2 sizes and then want to try a different size or style? Can I participate in the at home try-on program from outside the continental U.S.? Can I include my embroidery details on my initial try-on order to avoid confusion? If you would like to order sizes/and styles to try on first, please DO NOT add embroidery during the ordering process. When you log into your account to receive a return shipping label through our automated return process, you will be able to input your embroidery information at that time. To ensure consistent quality in our finished products we maintain an extremely sanitary environment in our embroidery studio. Unfortunately due to these concerns we simply cannot add embroidery to used, worn, washed, or soiled garments. We advise that you consult your local tailor for alternative options. How does your warranty process work? We offer a 1 year Professional Courtesy Guarantee. If you have any damages with your garment, please email us a photo of the issue to contact.us@medelita.com along with your full name and order number and we will assess whether the damage falls under our Professional Courtesy Guarantee.